Living spaces in this unique ranch home were designed with fantastic 270 degree views of the surrounding wooded hills. A unique open stair to a finished walk-out basement takes further advantage of the sloped site. 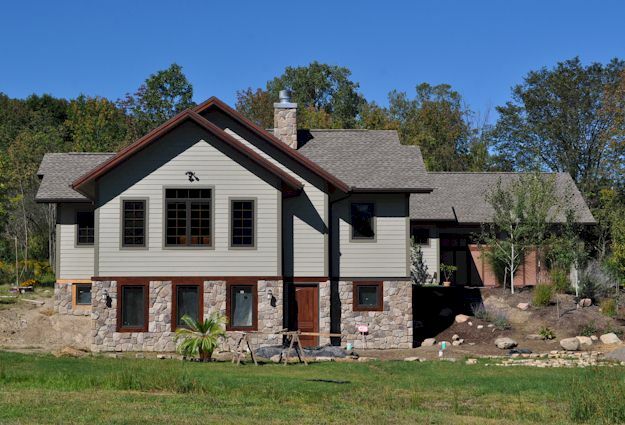 The handsome exterior features cultured stone, cement fiber siding and cedar accents. Deep, sloped roof overhangs, similar to those found on Craftsman Style homes, provide summertime shading. Mulitple evolutions of the floor plan resulted in a unique arrangement of interior spaces that are tailored to the Owners way of living.